The Cozy Stone Fireplace...Rest And Relax In A Rustic Setting! R & R in a Rustic Setting! 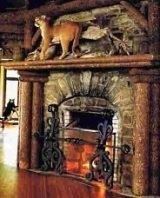 A cozy stone fireplace is one of life's simple, albeit wonderful, pleasures at the end of a long hard day . . . . . or when you need to escape from the hustle and bustle of daily life for awhile. Nothing comes close to relaxing near a crackling fire with a good book in hand to forget -- at least momentarily -- the cares of the world . . . as well as those of your own. ine a more perfect escape in a more comforting setting than that shown here! The rugged stone hearth pictured below also has many of the hallmarks of the Adirondack Style with its blending of tree trunks and branches and naturally formed fieldstones gathered on site. tive occasion with family and friends! The two corner fireplaces that follow also present a study in contrasts and provide a sampling of the diverse range of looks that are possible with a stone corner hearth. On the left, the soaring hearth extends from floor to ceiling and is clad with a randomly shaped and sized assortment of buff-colored stones. In stark contrast, the corner design at right is crafted from uniformly cut stone blocks that are dark grey in color. Limited in height by the steep pitch of the ceiling, the corner hearth, nevertheless, "extends upward" with the use of massive peeled logs stained a dark, rich brown color. position. Conversely, the design at right is crafted from cut granite blocks in random shapes and sizes. A roughly cut granite mantel shelf rests on stone corbels and adds to the rugged -- almost primitive -- look and feel of the overall design. Please check back often or subscribe to our RSS feed, as we fre- quently add new stone hearth designs to our site. Roughing It...American Gilded Age Style!